Systor's Hard Disk Drive (HDD) Dual Port Duplicators are the best in it's class. 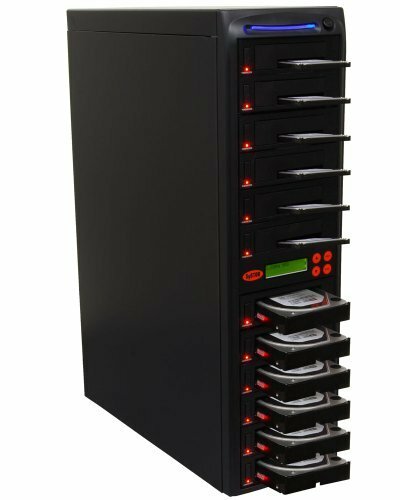 A complete standalone unit that can clone a 3.5"" and 2.5"" hard drive to multiple hard disks alternately in a single touch of a button. It copies the data sector by sector from the source drive to the target drives simultaneously, regardless of brand, operating system or format of the drives. The copy includes partition and boot sector information for a perfect clone. Systor HDD Duplicators are also DoD compliant when it comes to sanitizing / erasing data in the hard drive, this feature has been added to ensure that there are no trace of content left behind and for the consumers security and peace of mind. Fits both 3.5" and 2.5" hard drives without adapter. Complete standalone, NO software required / User-friendly LCD display. Easy operation. Copy, Compare HDD, PreScan, DoD Compliant Erase functions. HDD Sanitization/Eraser Feature: DoD 5220.22-M Data Sanitation Compliant. Secure Erase: Deletes & replace hard drive data with zero strings. Permanently wipes sensitive data to counter data remnants. Copy hard drive simultaneously at once up to 90MB/s . Clones hard disk data sector by sector. 3TB hard drive capacity. Windows, Linux and Macintosh Compatible. Reproduce the content faithfully. The stylish all-black door has built in vents for optimal cooling and air flow to keep your drives running at their best and LED status light to allow the user to keep track of their drives.